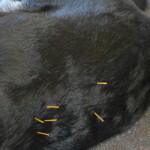 Are you a veterinarian interested in learning acupuncture? You can start a payment plan on your credit card to get the Early Bird rate. See details on the enrolment form. Acupuncture is an important part of a system of Traditional Chinese Medicine (TCM) developed over a period of more than 3000 years and used by over 1 billion people across the world. Drug free, it stimulates the body’s innate capacity to heal itself. Based on a different philosophy of health and disease, it adds to your diagnostic and treatment abilities and may enable you to diagnose and treat patients, where all the laboratory and imaging results are normal, but the patient is ill. If you find these cases frustrating, then now is the time to think about learning acupuncture and the benefits of TCM. Acupuncture can be used as a primary treatment or in addition to your medicine and surgery. The course gives you the ability to approach a clinical case in another way and choose the most appropriate treatment for that individual patient. Mentally stimulating, this course will expand your understanding of health and disease. 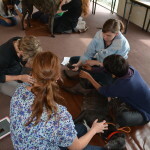 Our aim: To provide training to graduate veterinarians seeking to integrate acupuncture into their practice, either as a stand-alone strategy or in conjunction with mainstream medicine and surgery with a reliable, concise and industry specific course suited to their clinical needs. Our goals are to introduce acupuncture to the Veterinary profession and teach the skills to ensure you become a confident and qualified acupuncturist. We work with you to ensure you can successfully introduce acupuncture into your clinic and successfully treat your patients as knowledgeable and competent practitioners of acupuncture. The International Veterinary Acupuncture Society (IVAS) is a non-profit organisation dedicated to promoting excellence in the practice of veterinary acupuncture as an integral part of the total veterinary health care delivery system. The IVAS Course was first taught in Australia in 1991 and the 8th course in 2012 was the first IVAS course in the world to go on-line. 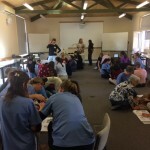 The Australian College of Veterinary Acupuncture (ACVA) is the only provider of the IVAS Certification course in Australia that provides face to face workshops with hands on practical training. Our experience over the past 24 years of providing acupuncture training has reinforced the importance of these hands on practical workshops. An Analogy that Veterinarians will all be familiar with is that of surgery. How confident would you feel if you were to do your first spey after just hearing a lecture or reading a text. How much more confident would you be if you had a mentor to show you the subtleties of the surgical technique. We believe this analogy also applies to acupuncture where the art of palpation to make a diagnosis and treatment is as vital as the needling technique. The 11th Australian IVAS Course started in January 2018 and the recent examinations in December 2018 shows the course delivers a high standard of training to IVAS examination requirements. Students will be completing their submissions over the next month or so to achieve certification. The practical hands on workshops Marcus Oldham College proved to be a highlight for our students and staff. 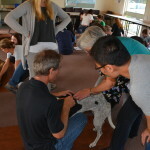 The course is a carefully structured program that teaches the theory of Traditional Chinese Medicine (TCM) and its clinical applications through on line lectures and face to face workshops enabling veterinarians to integrate acupuncture into their clinical practice, either as a stand- alone therapy or in conjunction with mainstream medicine and surgery to produce better patient outcomes. The program concentrates on dogs and horses as representative species making it possible to anatomically transpose acupuncture points to many other species. Lectures for cattle and cat are also included. The course is taught by an experienced team of dedicated lecturers, demonstrators and tutors and is divided into four terms, with weekly online lectures and on line assignments. At the end of the first, second and third terms there are practical workshops at Marcus Oldham College in Geelong. 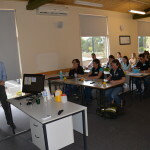 Throughout the course there is an emphasis on developing practical skills of diagnosis and treatment techniques and treating clinical cases at the workshops and in the clinic. See our brochure for full details of the course program and IVAS Certification requirements. Demonstration of acupuncture equipment such as needles, moxa, electroacupuncture and lasers.